Mr. Pradeep Wanigasuriya, Administrative Secretary presented the message of the world fisheries day. The service of Sister Marling as the former district coordinator was admired giving awards. Mr. Herman Kumara, National Convener of National Fisheries Solidarity Movement joined with the awarding ceremony. Mr. N.M. Aalam, President of Northern Province Fisher People Unity addressed the audience. Mr. Herman Kumara, National Convener of National Fisheries Solidarity Movement addressed the gathering. 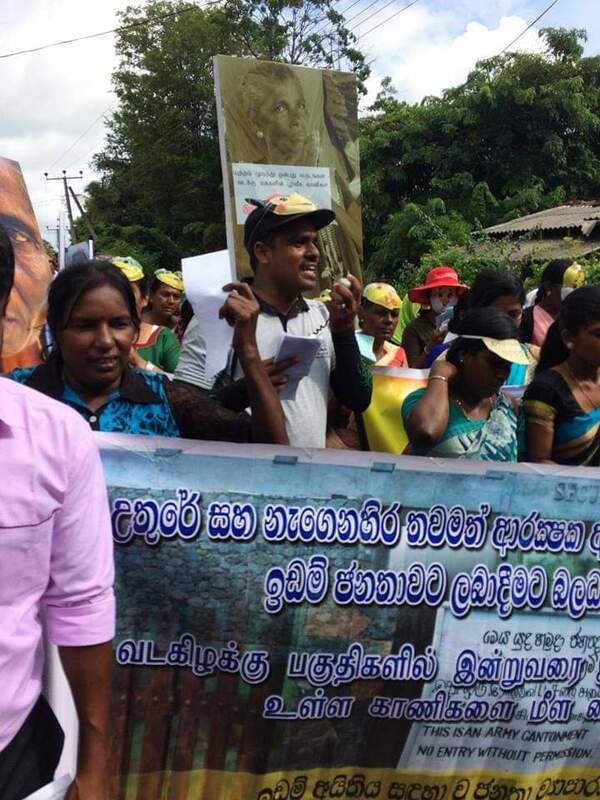 Mr. Wasantha Abekoon, Coordination secretary of president in Polonnaruwa, addressed the gathering. Miss. Kamani Dilrukshi, animator of Miridiya Deewara Organization did thank for the participants finally. World Fisheries Day is on 21 of November in every year. The world fisheries day is being used to raise the voice of the fisher people on the issues, challengers as well as victories in world wide. National Fisheries Solidarity Movement has been commemorating the world fisheries day for 22 years. This is the most important event of National Fisheries Solidarity Movement. National Fisheries Solidarity Movement with the collaboration of Miridiya Deewara Organization in Polonnaruwa organized the world fisheries day commemoration at the Auditorium of Royal Collage primary school in Polonnaruwa on 21st of November 2018. The theme was “Stop resource grabbing under the mark of blue green economic vision, let us ensure food sovereignty, let us adopt people based national fisheries, agriculture and land policies. Mr. Wasantha Abekoon, Coordination secretary of president in Polonnaruwa, Mr. Herman Kumara, National Convener of National Fisheries Solidarity Movement, Office In Charge of the police in Polonnaruwa, Sister. Marlin, former District Coordinator of Miridiya Deewara Organization participated as chief guests in the event. More than 550 members have participated representing 16 partner organizations of the network. The event had two parts such as in outdoor march and indoor forum . 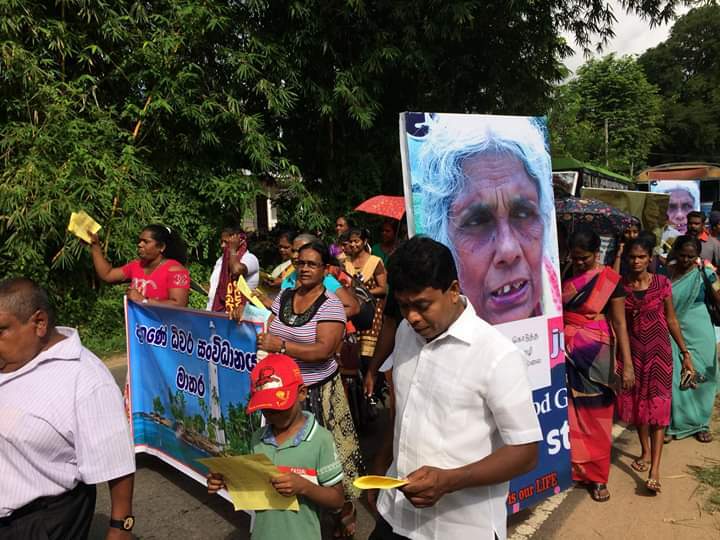 The campaigners marched from near the cannel to the auditorium saying slogans and singing songs in order to ensure the rights of the fisherman, farmers and working people. Community leaders who participated in the march gave massages to the authorities by using different colorful creations. They have kept cutouts, placates and posters in their hands. The main part of the commemoration was started after the march. A welcome dance was performed by a dancing group of Mirididy Deewara Organization. Then, oil lamp was lighted by the invitees. After that, Mr. Pradeep Wanigasuriya, Administrative Secretary presented the message of the world fisheries day. The study survey report which was prepared by Praja Abilasha Network and National Fisheries Solidarity Movement according to the irrigation culture, existing situation and sustainability usage in northwest and north central was launched. The study survey report related to the “women fish producers” was launched with the participation of Miss. 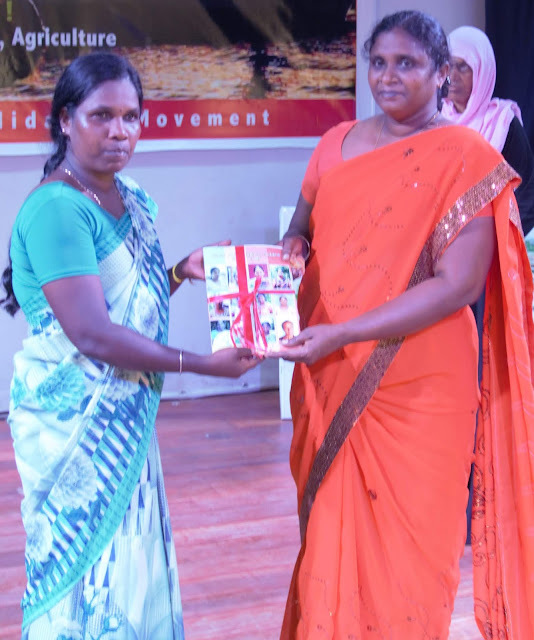 Jeyachithra, animator of Rural Laboural Society in Jaffna, Miss. 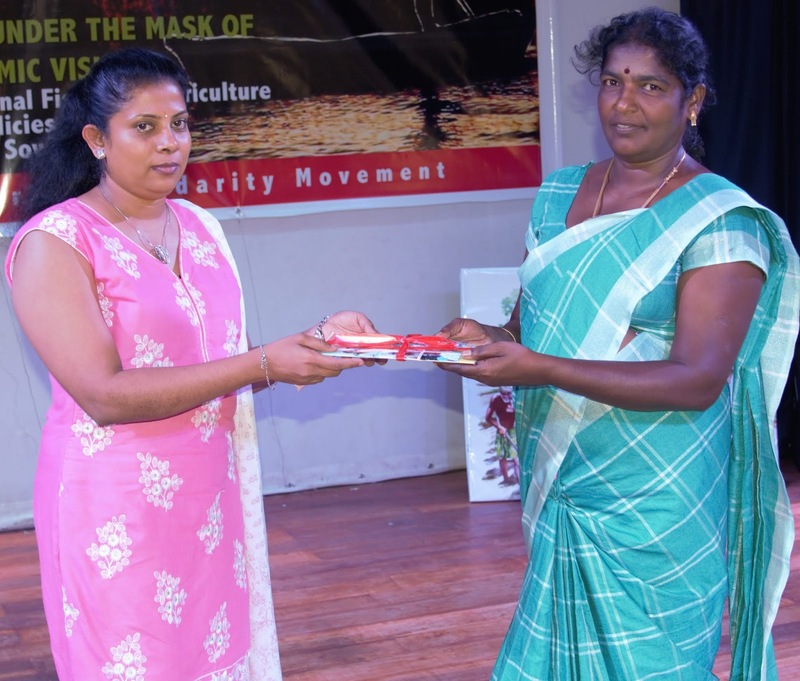 Marry Priyantha, animator of Mannar District Fisheries Solidarity Movement, Mrs. Lavina Hasanthi, Women Coordinator of National Fisheries Solidarity Movement and Mr. Kannan Gokulan, Animator of Ampara District Fisheries Solidarity Movement. Mr. M.M. Mohamad Raheem, District Coordinator of Trincomale District Fisheries Solidarity Movement was awarded admiring his commitment in order to organize the fisher community toward fisheries movement. He has been working for 14 year with National Fisheries Solidarity Movement. Mr. M.M.M. Raheem is the most senior activist of the organization. His service was admired in the 22nd world fisheries day commemoration. Mr. N.M. Aalam, President of Northern Province Fisher People Unity addressed the audience. He highlighted situation of fisherman and fisheries industry in the north and east. Another survey report was launched in the event. The country paper of land right was launched. After a cultural item, Mr. Herman Kumara, National Convener of National Fisheries Solidarity Movement addressed the gathering. He highlighted the existing situation of the fisheries industry, challenges, issues as well as blue green economic vision. He invited to the people organize to work toward ensure the rights. Mr. Mohamad, Chairman of the National Committee of National Fisheries Solidarity Movement lead to get the proposals from the participants for the future actions. Miss. Kamani Dilrukshi, animator of Miridiya Deewara Organization did thank for the participants finally.